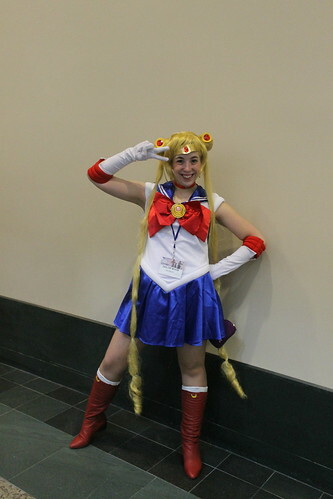 I attended Anime Boston this past Saturday, this was either the fifth or sixth year that I attended; can’t quite recall if I attended in 2009 or not. 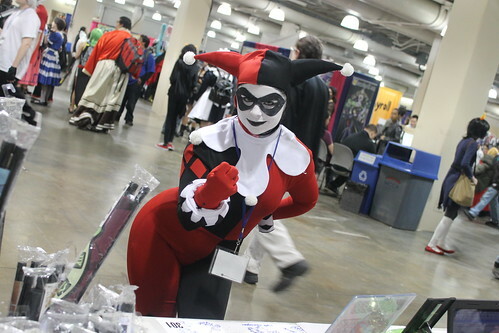 I went with Requiemart again this year and we both helped out at Animadness‘ booth in the afternoon (I was wearing a Joker/Harley Quinn tshirt). I did not attend any panels or the bjd meet this year, my main focus was hunting for various things in the dealer’s room and photographing cosplayers on occasion. I took quite a few cosplay photos this year..
I’ll start with the comics based cosplayers.. 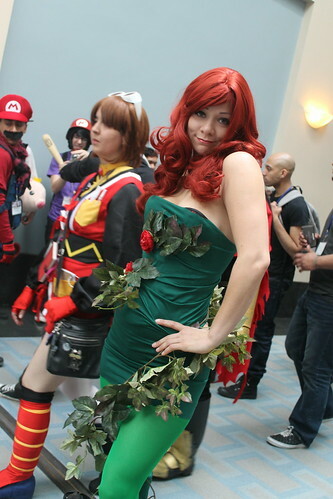 I saw no less than three Poison Ivy cosplayers this year.. I think this one was my favorite even though it is also the most modest. She was almost too sweet to be Poison Ivy. She even has green lipstick! 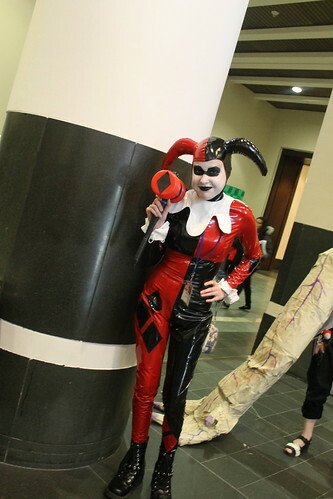 I didn’t see as many Harley Quinns this year as I did last year. Another Harley Quinn, this one in vinyl. .. and the Joker because I love the Joker. I saw a few this year but this one was the best in my opinion. I adore Rozen Maiden, so I was super excited to see Shinku this year. 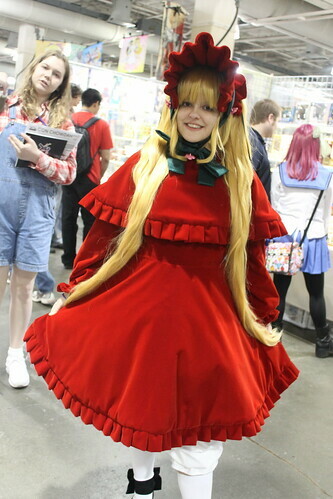 She was by far the best Shinku cosplayer I have ever seen in person. 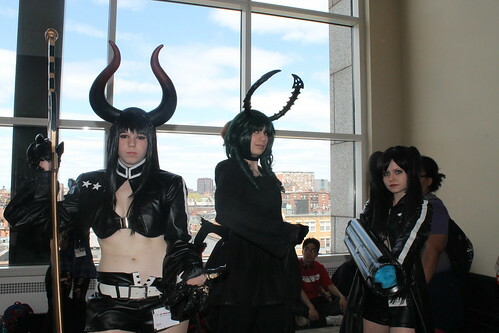 Group of Black Rock Shooter girls, these three were awesome! 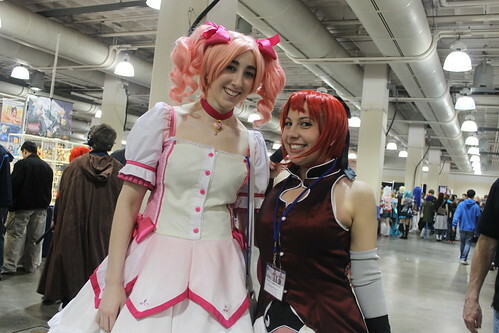 Madoka and Kyoko from Puella Magi Madoka Magica, I actually saw quite a few Madoka cosplayers this year. I was kind of sad I did not see any Mami cosplayers though :(. 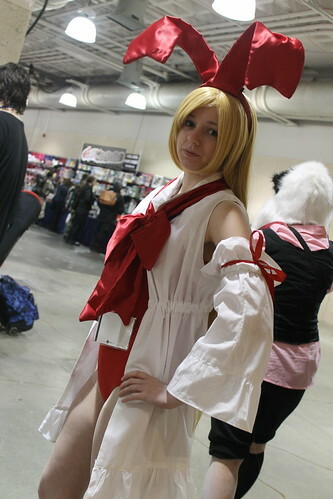 Devil Flonne from Disgaea, I this is the first time I have ever saw someone cosplaying Flonne so I was pretty excited. 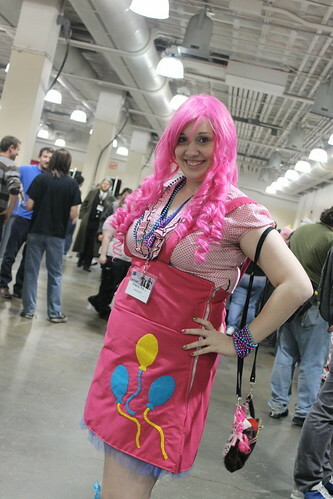 A very brave Felicia cosplayer ( I say brave because Felicia’s outfit is so revealing and I can’t even imagine how she managed to get it to stay on). 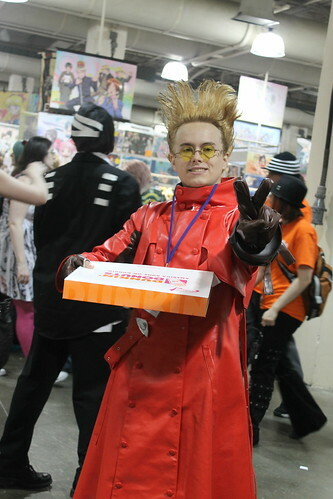 My favorite Vash from Trigun this year, I saw a couple but this guy even had the donut box so he gets bonus points! 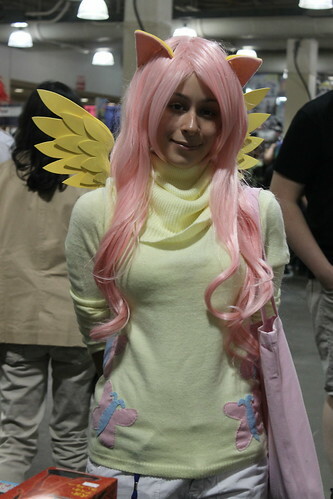 I saw quite a few non-anime cosplayers too including My Little Pony… I’ll admit I was surprised how prevalent ponies had become this year, I saw a lot of booths selling MLP t-shirts and quite a bit of stuff in the artist alley not to mention the cosplayers. 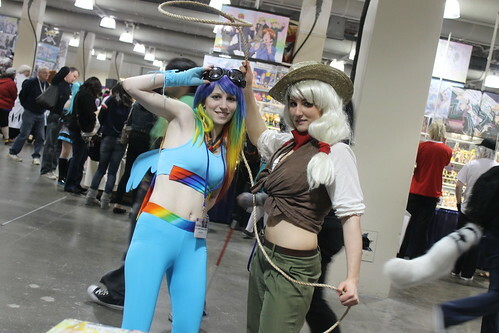 Rainbow Dash and Applejack- Two of my favorite ponies so needless to say I was quite pleased to find these two together. 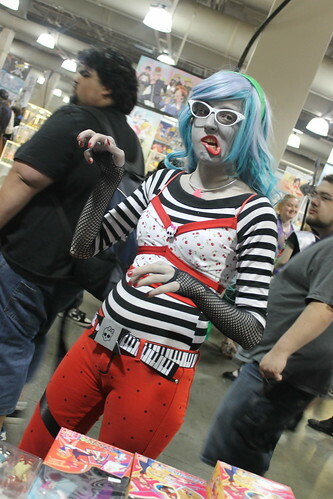 .. and even someone cosplaying as Ghoulia from Monster High! 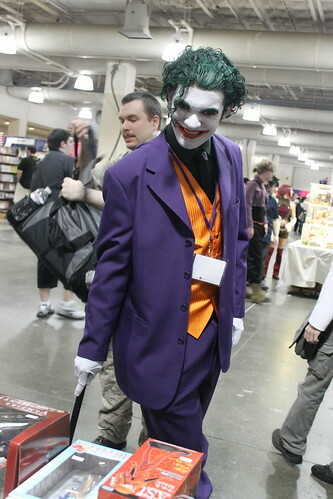 This cosplayer was amazing! AND… while I did not find the one thing (namely the GSC figure of Triela from Gunslinger Girl) I was really hoping to find in the dealer’s room, I did find some other things..
Clicking on the picture will bring you to flickr where there are notes on each individual thing.. I bought quite a bit from Animadness (all five nendoroids, Miku append figma and the Hello Kitty plush I got for the zilla) this year. While I may favor them a bit (I did volunteer at their booth this year, I wouldn’t have done that if I didn’t like them), I can honestly say that Animadness’ booth had one of the best selection of figures and also had some of the best prices. 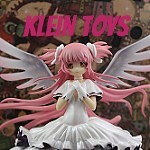 I bought a Magic Knight Rayearth doll outfit set for an eventual pullip custom I am working on from Asylum-Anime . I bought the Rei figma from Toyslogic. I honestly can’t remember which booths I got the rest of the stuff at ^^; The Joker print came from the Artist Alley. The big white trunk was not purchased at Anime Boston it contains something I bought from Requiemart. I also got a wall scroll from Madoka but I somehow managed to leave it behind in Requiemart’s car >_< . 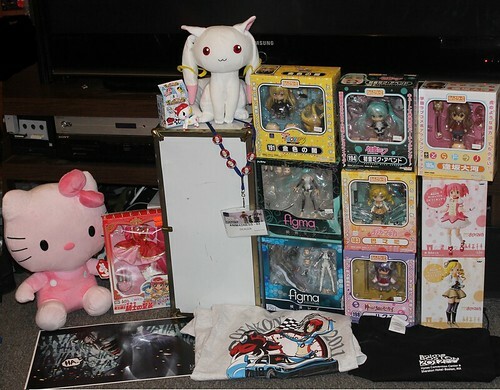 This entry was posted in acquistion, anime figure, Anime Swag and tagged anime boston, anime figure, applejack, cosplay, dc comics, disgaea, evangelion, figma, flonne, ghoulia, harley quinn, hello kitty, joker, kyoko, madoka, miku, monster high, monster high ghoulia, my little pony: friendship is magic, nendoroid, pinkie pie, poison ivy, Puella Magi Madoka Magica, rainbow dash, rei, rozen maiden, sailor moon, shinki, taiga, todadora, trigun, vash, vocaloid. Bookmark the permalink. Oh hey, that Felicia is totally me! Honestly there was nothing to worry about it. The whole thing was adhered down to my skin…it wasnt going anywhere. Aah, you’ve got the Miku Append nendoroid! Will you post about her soon? I’m personally wondering whether or not I should invest in her. I should have a blog post up about her within the week, nendoroids always take me a little bit longer to photograph because of all the little fiddley bits I have to say she looks pretty awesome just in the box. Awesome, thanks! I had a feeling but I just like to be sure if it’s at all possible. This post is old but…. DID YOU BUY BIG PULLIP? !